Thank you, Simply Hand Made! 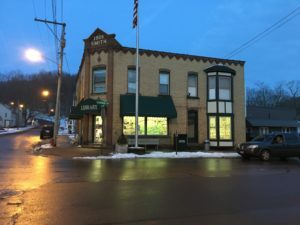 The library was presented with a donation to be used for new books, the first distribution of funds by Simply Hand Made, the wonderful gift shop down the street. Simply Hand Made was established in 2016 as a non-profit shop, located in the 101-year-old Fredericksburg Jail building, with the purpose of Promoting local artists and makers, Preserving the historic jail building, and Providing for the Fredericksburg Community Library. 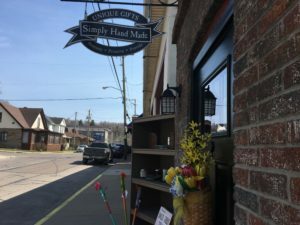 Please click on the “Simply Hand Made” page above for more information about this great place! Thanks to the Simply Hand Made Board and volunteers who make this all possible!! Comments Off on Thank you, Simply Hand Made! 2018 marks the 20th anniversary of the opening of our library. Special events will be happening- stay tuned! Comments Off on Start the celebration! 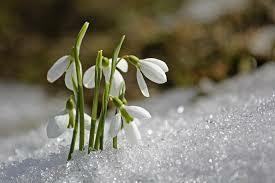 Then listen close to me….. Warm wishes for a bright year filled with possibilities, from all your friends at the library! It must be Santa! Saturday, December 9 will be the date for our annual Christmas at the Library! 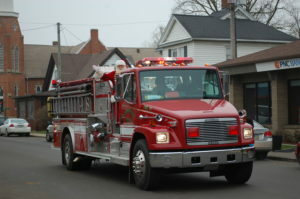 Come and decorate a gingerbread house to take home, hear author David Lorah read his book The Night Santa Lost His Pants, then get ready for Santa to arrive on the firetruck, stopping in to listen to all the Christmas wishes of the boys and girls who come to see him. He will also light the community Christmas tree and start his train rolling on the tracks beneath the tree. It’s all free of charge! A suggested donation of a non-perishable food item, toy or socks will help us fill Santa’s pants for a good cause! It all starts at 10 a.m.-gingerbread house decorating ( sign up required), 11 a.m.: David Lorah, 11:30- Santa arrives. Comments Off on Hear that Jingle, Jingle? Thanks to all who made the 13th Annual Library Roll a huge success!! Thanks to the 171 riders who came from near and far. ( a special shout out to our friends from Kentucky & Pennsylvania who make the trek to Fredericksburg each year!!) 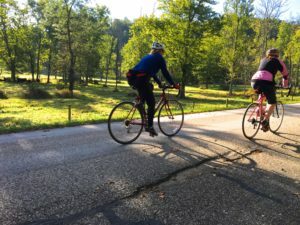 Thanks to those of you who come to ride and support the library, and those who come to ride to meet the challenge of the Holmes County hills, and those this year who came to ride in honor of Jeremy Grimm. Thanks to our hospitality team- John, Dee, Chris, Karen, Katie & girls, Charlotte, Robert, Brenda, Peggy, Millie, Dave, Jeannie, Joe. Thanks, Kristin, for your wonderful artwork for the shirts each year. Thanks, John, for marking the roads. See you next year!! September 29, 2018! Comments Off on THANK YOU AGAIN!!! Are you ready to ROLL???? 23 days to go! 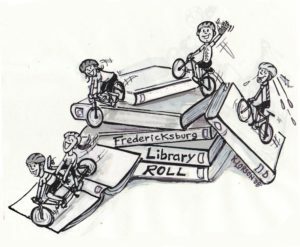 The 14th Annual Library Roll is happening September 29!! This is the library’s major fundraiser for the year- a fun day for all ages & abilities, from trail riders to those who measure a ride in climbing feet……and there are free, delicious fry pies at the finish line. It doesn’t get any better than this!! Preregister by September 15 to guarantee your free long-sleeved commemorative t-shirt designed by Kristin Lorson. 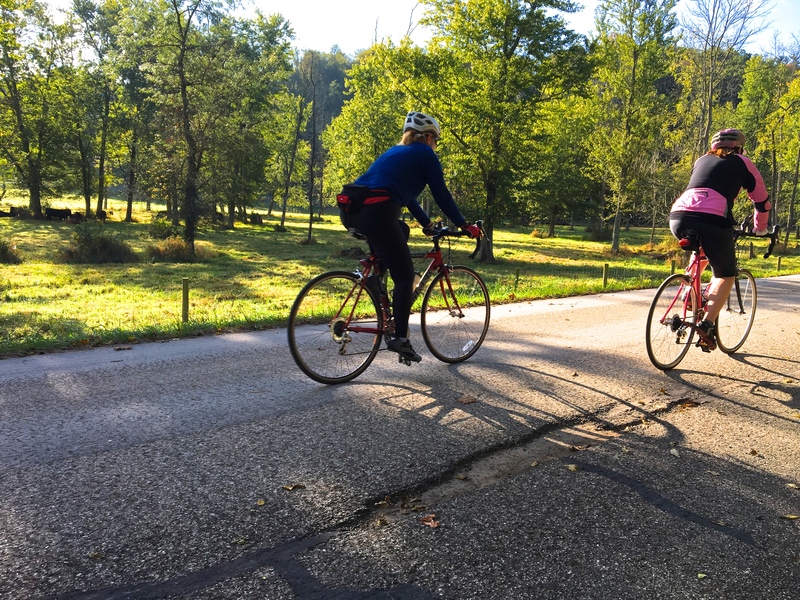 Preregister for the 62 mile ride before Sept. 15, finish the ride, and be eligible to win $300! Click on the tab above for more info- we hope to see you soon!! Comments Off on Are you ready to ROLL???? We are so grateful for the many ways people find to support the library. Our community businesses, churches, and individuals are all so generous. 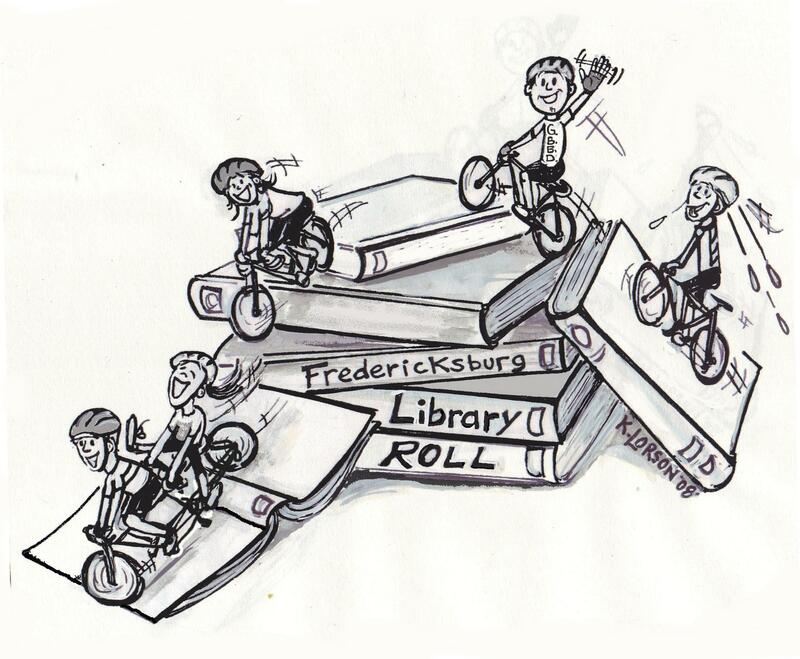 Sometimes we receive donations from people from far away, who come to Fredericksburg to ride in the Library Roll, or just to visit, and are moved to give. If you are one of these people, know that every time we receive a gift, it is so appreciated, and encourages us to keep this “Little Engine That Could” going. This year we celebrate the opening of Simply Hand Made, a wonderful little gift shop in the 100-year-old jail building, with proceeds benefitting the library. The talented artists and makers who place their items there for sale do so on commission, knowing they are also supporting the library. The volunteers who give their time at both the library and Simply Hand Made are the other reason the library is here, 19 years after opening. We are pleased to announce that the library has received grants from The Wayne County Community Foundation and the Laura B. Frick Foundation which will go toward the renovation of the McCay building across the street. This beautiful building, built in the 1800’s, will house a coffee shop and a display area for the library’s Fredericksburg history collection. Known as J.C. Weaver’s store, many here in Fredericksburg have great memories of working or shopping there in the 1950’s & 60’s. Stop in the library, the next time you are in this area. We would love to tell you more! Comments Off on THANK YOU!!!!!!!!!!!!!!!!!! 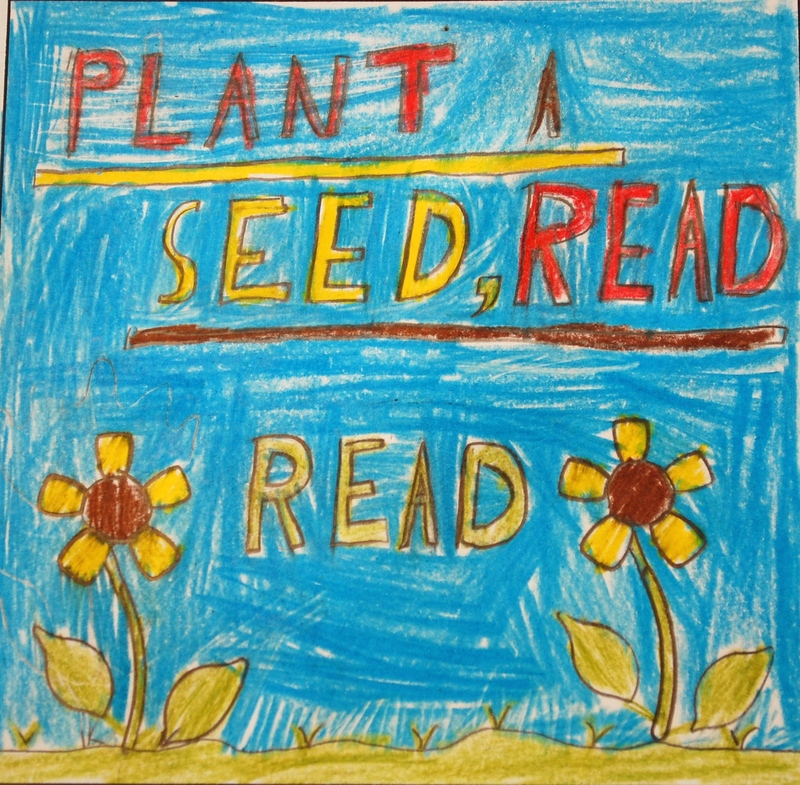 PLANT A SEED, READ THIS SUMMER!! READ 1,000 MINUTES THIS SUMMER!! SIGN UP NOW AT THE LIBRARY! PRIZES! COUPONS FOR ICE CREAM!! WEEKLY DRAWINGS!! CHECK OUT THE NEW BOOKS AND OLD FAVORITES !! 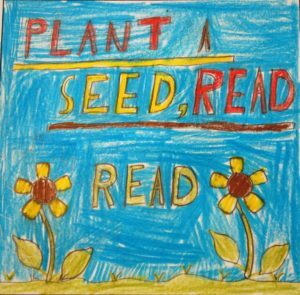 Comments Off on PLANT A SEED, READ THIS SUMMER!! 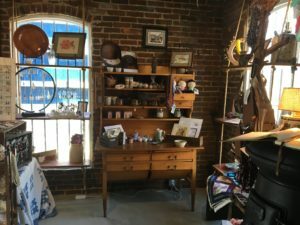 Click on “Simply Hand Made” above to find out more about this unique gift shop in Fredericksburg!! Comments Off on Simply Hand Made! 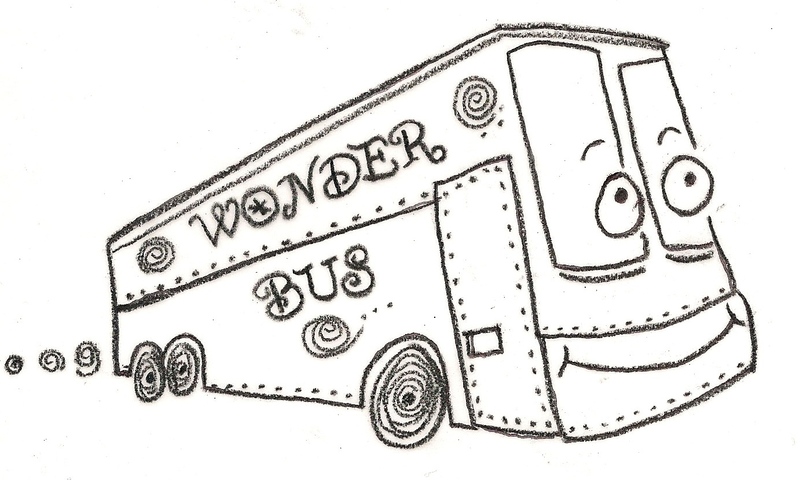 The Wonder Bus is Coming! We are off to Cleveland on Saturday, May 20, for a tour of Progressive Field, followed by the rest of the day at the Great Lakes Science Center!! Click on the link below for more info! Sign up now to reserve your place. First come, first served. The bus is filling up!! 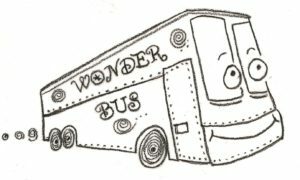 Comments Off on The Wonder Bus is Coming!